There is a great deal of mythology, folklore and every day cultural references that come from blacksmithing. ‘You have to strike while the iron is hot‘, having ‘too many irons in the fire‘, going at it ‘hammer & tongs‘, something having ‘a nice ring to it‘, etc. Ever wonder why a horseshoe is considered lucky? 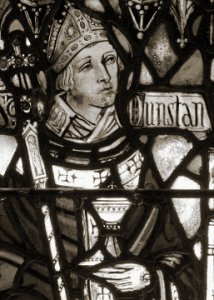 You can thank this guy: St. Dunstan – Patron Saint of Blacksmiths, Locksmiths, Goldsmiths and Silversmiths (as well as musicians and Charlottetown, P.E.I., Canada) . One story, tells of Dunstan during his time as a hermit monk at Glastonbury. While working at his forge (for he was a talented metalworker), the devil came to him, disguised as a young woman. She tried to tempt / seduce Dunstan, to lead him astray. While she was dancing around, Dunstan spotted cloven hooves under the dress, and realized the woman was the devil. 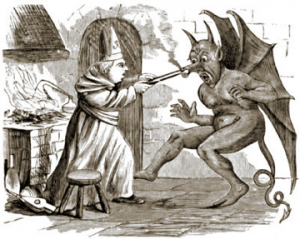 Dunstan grabbed his red-hot tongs from the forge, and grabbed the devil by the nose, causing him intense pain – his screams could be heard three miles away. 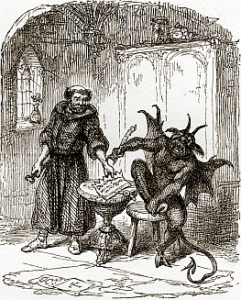 Another legend, tells of how Dunstan hobbled the devil by nailing a horse shoe to him, in a manner that caused him great pain. Now this is where old folklore gets confusing, because there are a few different versions of it. In one version, the devil disguises himself as a weary traveler, asking to have his horse shod. In another, the devil sees how happy freshly shod horses seem – looks down at his own cloven hooves and thinks “hmm, maybe I should get some shoes too…“. But in either case, he ends up with painful shoes on his own feet; and begs Dunstan to remove them. Dunstan agrees, but first makes the devil promise that he will never enter a place that has a horse shoe displayed. Whatever the origins of the stories, the underlying message seems pretty clear – the devil tries to steer clear of blacksmiths (and presumably farriers)! Today, May the 19th, is the feast day for good ol’ St. Dunstan. Now I’m not particularly religious, but it seems a good enough reason to recount these fantastic old stories, and to perhaps hang up a horse shoe in the work shop for some good luck. Some traditions say to hang them with the heel (points) up, to keep the luck from running out. Others say to hang them with the heel down, so that the luck will flow out of them onto those who walk underneath. Some traditions say that the shoe must be used, not new; that it must be ‘found’, not purchased; and that it’s only lucky for the person who found it. Generally, in North America, consensus is that it should be hung heel up, over or beside the door of your home. The exception to the heels-up rule, is in a blacksmith’s shop – where they should be hung heels down, so that the luck flows out onto all those who pass beneath. Because it is the smith, or farrier, who imparts the shoe with its luck (see story of St. Dunstan above), there is no fear of the luck running out.